Burchill and McCamley work across a number of different media including sculpture, painting, photography and video. Neon is a recent and significant development because it combines their interest in text and materiality. Neon is a seductive and luminous material, most often used for advertising. The glass is hard and the hazardous gas housed within it vaporous, so it represents two material extremes - an incongruity not lost on Burchill and McCamley. 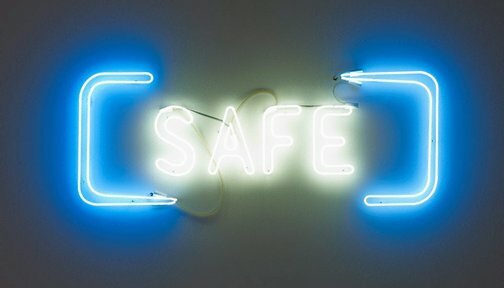 The titles of their neon sculptures are drawn from an array of sources including art, films, literature etc. ‘SAFE’ is drawn from a movie of the same name; in fact identical typography was used to promote the movie on posters and billboards. ‘SAFE’, directed by Todd Haynes, is about a wealthy suburban woman Carol who becomes allergic to her environment. Slowly Carol, played by Julianne Moore, becomes sicker, hyperventilating and covered in rashes. She moves to a country retreat which is meant to be free of pollutants but simply becomes sicker. Doctors cannot diagnose her illness. The question that Haynes asks but never answers is: Is Carol’s sickness neurotic and self-perpetuating or is it real? Hayne’s detached directing style maintains an eerie sense of balance, his film offering no answers or solutions. Burchill and McCamley achieve the same sense of equilibrium in their work. 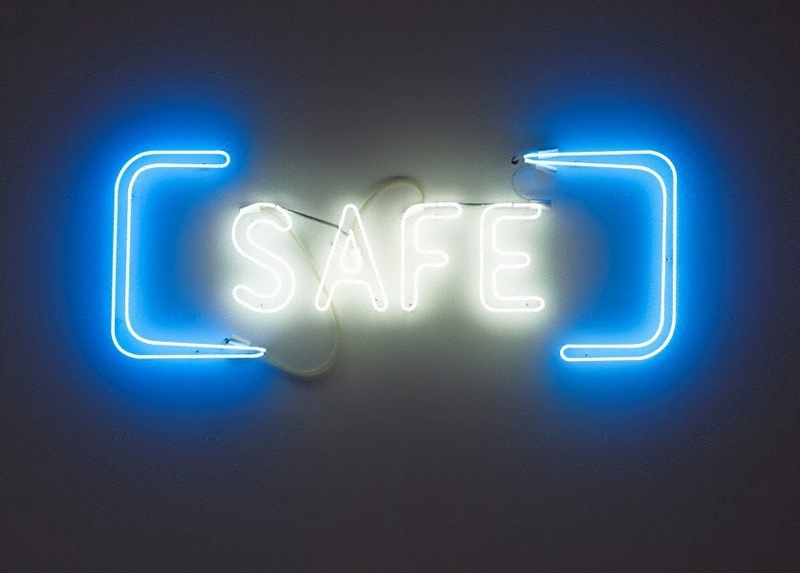 By bracketing the word SAFE the artists simultaneously communicate the content and then open it up for debate because the parentheses act as a digression. The brackets appear like abstract hands holding up or securing the words in place. Why would something safe need to be protected? In fact questions without answers explain Burchill and McCamley’s methodology. They intend for the viewer to engage with the physicality of the object and be provoked into asking questions. Language becomes their material. Our general understanding of the word, safe, also comes into play as Burchill and McCamley’s neon taps into contemporary anxieties. To be safe is to be secure, protected and out of harm’s way. In recent times safety has become a political issue with western countries creating legislation to deal with terrorism. Law, order and policing continue to remain key election issues and the promise of personal safety is increasingly a vote winner.